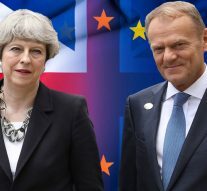 In a letter to European Council President Donald Tusk on Friday the 5th of April, Theresa May repeated her wish for the UK to “leave the European Union in an orderly way and without undue delay”. Many wonder how can the prime minister believe that someone will still take these statements seriously, after all the chaotic (mis)management of the Brexit deal. Indeed, the Parliament has rejected the Brexit deal proposed by the Government and Theresa May has now tried to engage Jeremy Corbyn, basically attempting to have the Labour party co-responsible – if not entirely – for the current erratic situation. Fun fact is that if the UK were not to find a new deal – to be accepted not only by the UK Parliament but by the EU too – by the 23rd of May, they should hold European elections. “The government will want to agree a timetable for ratification that allows the United Kingdom to withdraw from the EU before 23 May 2019 and therefore cancel the European Parliament elections, but will continue to make responsible preparations to hold the elections should this not prove possible,” she wrote. EU leaders are not likely to welcome enthusiastically May’s request. In fact, they already rejected an identical request at a Council summit two weeks ago and exactly because it would interfere with the European elections. What is different this time, however, is that May conceded that if the UK has not left by 23 May, it will take part in the EP elections. But the confusion this would create around the European elections is inevitable. Tusk has recommended a flexible one-year extension to the Article 50 process, with the possibility of the UK leaving the bloc as soon as it can pass the withdrawal agreement. Still, any extension would require unanimous agreement of the 27 EU leaders. European Commission President Jean-Claude Juncker told MEPs that another short-term extension would not be possible unless a deal has been struck in the House of Commons by 12 April. So only a long-term one can be taken into account? The UK government has already started preparing to hold the European elections, instructing local authorities and the electoral commission to prepare polling stations and ballots. Both the Conservatives and Labour have candidates’ lists and campaign plans in place. But are the British citizens fully aware of what’s going on? How to vote in such an uncertain frame? UK MPs have voted down by strong majorities May’s Withdrawal Agreement three times. They then narrowly failed to agree to back any of a series of alternative Brexit options, with plans for the UK to be part of a permanent customs union with the EU, or a second referendum, coming up short by a handful of votes. And a million people taking the streets on the 23rd of March demanding it. May’s apparent determination to avoid a ‘no deal’ scenario has prompted a furious reaction from many in her Conservative party, as has her decision earlier this week to open cross-party talks with Labour leader Jeremy Corbyn in a bid to strike a compromise. Labours are holding talks aimed to establish whether they can unite around a compromise Brexit plan under which the Withdrawal Agreement would remain unchanged, but with changes being made to the accompanying Political Declaration on future relations. May is expected to set out the options, likely to include customs union membership, in a further letter to Corbyn on Friday. If a compromise cannot be agreed, May signalled that MPs will vote on a “small number of clear options on the future relationship” in a last-ditch bid to find a way forward. And if they reject them all? Bids for the no-deal scenario are getting serious.